I’m an art historian. 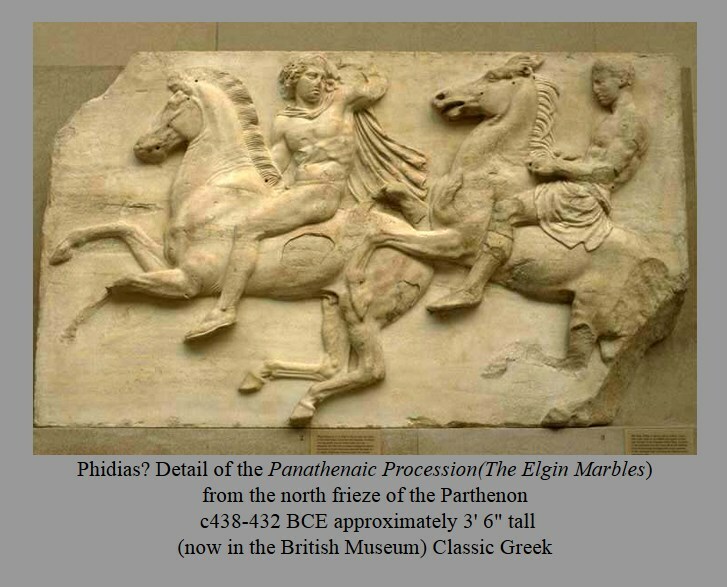 One of the things that I teach about in depth is the history of Greek art. 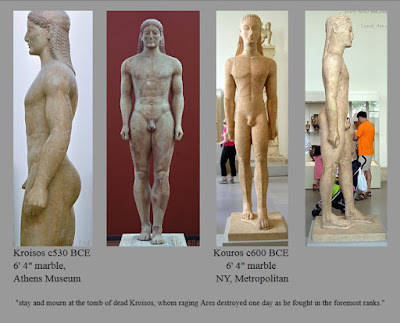 One of the things that defines ancient Greek art from the archaic periods to the classical is the idea that most of the art depicting males share several qualities. 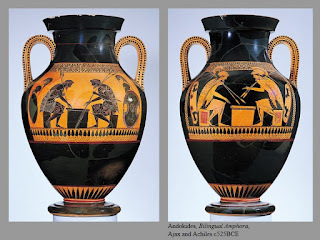 Ancient Greek art, for example vases, often have a warlike bent to them. 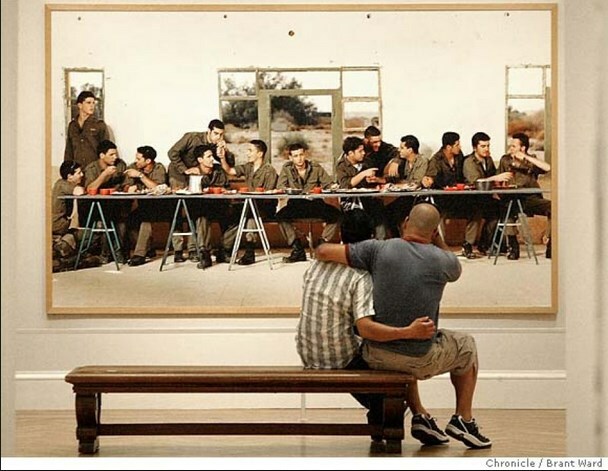 It’s clear that the Greeks were always at war. The ancient world just demanded males to be able to compete on the battlefield. Many of the vases from the ancient Greek world show themes from the Iliad and earlier ones just show warlike themes with hoplite warriors and breaks in the war. For example, this Mycenaean vase shows this kind of theme. As art developed towards the classical phases one of the themes that comes up a lot is warriors taking a break from the battle. In these examples here we see Ajax and Achilles taking a break and playing a game of checkers between bouts. If you look at the Panathenaic freezes, from the Parthenon in Athens from around 450 BCE one of the things that you see is that all of the friezes depict beautiful young man who athletically fit. Their bodies clearly show that they are able to be athletic and therefore they are also able soldiers. The same thing is true with some of the grave markers. These kouros figures from the archaic period, although they are very stylized, depict a young wasp wasted male who is beautiful has broad shoulders and is very powerful. In fact there was a concept in ancient Greece called “kalos” which roughly translated means morally good and physically beautiful. The Greeks like us believe that the package represented the contents. The Greeks also believed in heroes. The type of heroes depicted in epic poetry like the Iliad and the Odyssey by Homer from around 800 BCE. The warriors are always described as “shining” and beautiful. 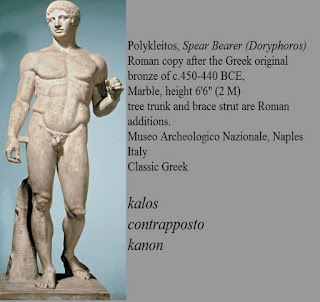 The same is true of this sculpture from around 450 BCE called the Doryphoros by an artist named Polykleitos. It’s often called the Canon because it depicts what Polykleitos thought was the perfect set of proportions. Again, this kind of depicts the cult of war and the able-bodied warrior that would be important in the ancient Greek world. 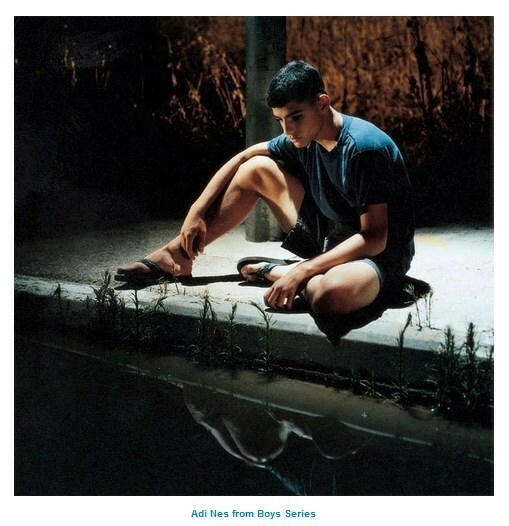 The same thing is true about Adi Nes’s work. The images were provocative and beautiful and the images of the young beautiful man in the photographs were both violent and gorgeous. The scale of the photographs was gigantic some of them as large as 5 feet or 6 feet long and several feet tall. They felt to me almost like friezes from the Parthenon. Recently I did some research on Adi Nes and here’s with the Huffington Post had to say about his stuff. 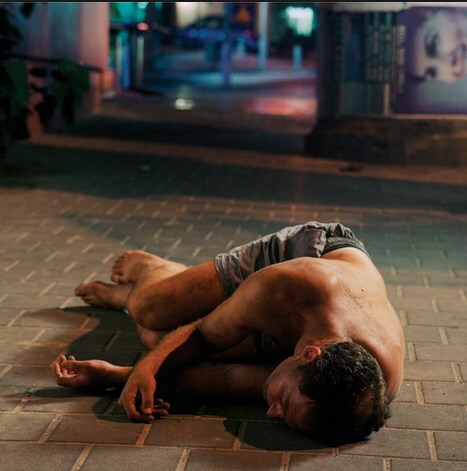 Adi Nes is a gay Israeli artist whose work, including his latest -- "The Village," explores concepts of masculinity and power. He has been praised by Richard Goldstein at the Village voice for his unique vision, who stated, "No young artist has so vividly captured the hidden cost of victory, the fine line between power and fragility, the interplay of arrogance and despair that shapes wartime identity." Although I intrinsically agree with the Huff Post’s analysis I’m not so sure about “the hidden cost of victory.” In fact, I think that the artist’s work might actually be a celebration of the male form and the beauty of a muscular body’s ability to commit acts of violence.